Are you having problems using Samsung S Voice function on your Galaxy S5 smartphone? Here's a few quick tips that could offer solution to the problem. But before we get started, let us first define what exactly is the S Voice problem we are dealing with in this content. Read on to find out more. The user cannot wake up S Voice on the lock screen and the voice control or commands are not working, preventing the user from using Samsung S Voice function on his phone. What could possibly caused this problem to occur on the device? Before we get to the troubleshooting process, let us perform the following recommendations to isolate and/or determine the real cause of the problem. 1. Check the microphone and make sure it is free from any obstruction like a case or cover. 2. Try to use the S Voice function again and make sure you are in a relatively quiet area this time. Remember that the device's microphone can detect background noise, which may interfere with the device and barring it from recognizing your voice. 3. Make sure there is no physical or liquid damage present on your phone. Try to remember any instance when you accidentally dropped it or exposed it to moisture. If so, then you'll need to get your phone fixed as soon as possible for you to be able to use S Voice. 4. When was the last time you've updated your device software or firmware? If you haven't yet done it, then it's time for you to check for any available software updates for your device at Samsung website. Upgrading the device software/firmware is recommended because updates are typically rolled out to fix any existing device issues so as to enhance its functionality. 5. Make sure you have an active connection or connected to the network. Similar to other S5 features, S Voice would require your phone to have active connection to the network to function properly. 6. Check for any third-party app installed on the phone, which you suspect incompatible with your device's software or with the device itself. 1. Touch Apps from the Home screen, to get started. 2. Select S Voice to get to the S Voice page. 3. Hold the phone at around 11 inches-20 inches or 30 cm-50 cm away from your face. It's the recommended distance from the phone to your face when using S Voice. 4. Say "Hi Galaxy." This is your preset command. 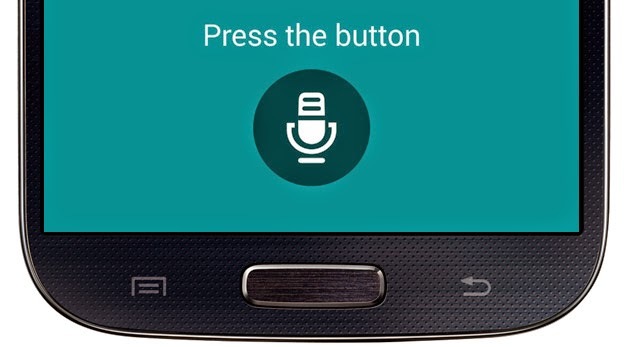 Another option is to touch the microphone icon to wake up S Voice. 5. Be sure to speak clearly and use concise tone. Hope the S Voice will function on your Galaxy S5 smartphone as expected this time. Otherwise, we'll have to try other possible resolution procedures or workarounds to deal with this problem further. Samsung S Voice is not available to all Samsung devices.